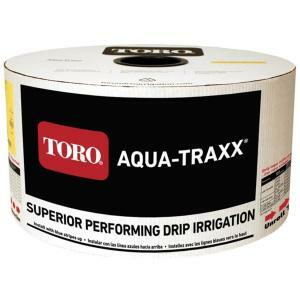 Toro Aqua-Traxx® with the PBX (Proportionally Balanced Cross-Section) Advantage optimizes flow path turbulence, which in effect, manages water flow, delivers uniform distribution, and reduces clogging. The seamless construction provides strength and durability, multiple inlet filters design reduces clogging issues, making Aqua-Traxx ideal for above ground and sub-surface applications. This superior drip tape will increase efficiency and improve crop quality by putting water and fertilizer right where you need them, at the root zone!